You didn't know about Phantom of Paradise until 2017?? Nope lol. Shocked myself because I thought I was a self respecting De Palma fan. Somehow I missed this. Though in my defense, I generally stay clear of musicals. I've always hated them. While we're at it, I feel compeled to add that the movie is based on a French novel from 1910 (although that specific mask is unique to the movie). The Brazilian Air Force emblem reminds me a lot of the Band of the Falcon's flag. There's been a lot of Band of the Falcon insignias / emblems and I have another one for you. 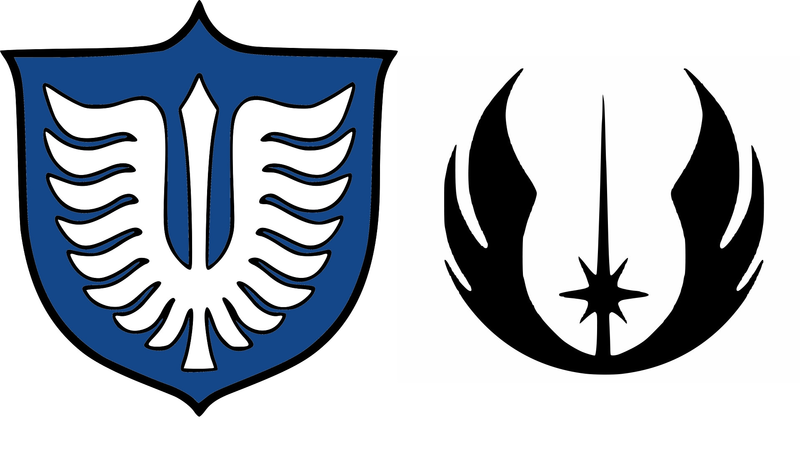 When I see the symbol for the Jedi Order from Star Wars (right) I always think about Berserk (left), it feels like a straight up sci-fi interpretation or a re-imagining of sorts. Akuma from Tekken 7 reminds me of Zodd. Those who stand fast and delve into the dark. I know this has been mentioned before at points but I was watching The Night Before Christmas with my son last night and I couldn't help but be reminded of the visual similarity between the evil wheelchair bound Dr. Finkelstein and GH member Ubik. Obviously coincidental, but Dr. Finkelstein is a great antagonist character that does indeed have an evil appearance which is very effective at being scary to young children. Something about those dark glasses tightly pressed into a bald white head and a creepy mouth with big lips. Miura tapped into this unique type of appearance with Ubik originally. Seeing Dr. Finkelstein in motion in the claymation style had me trying to visualize what Ubik would be like while watching his scenes, which I could picture well. I forgot how well done and unique Nightmare is, having not seen it in many years. Not much else quite like it. 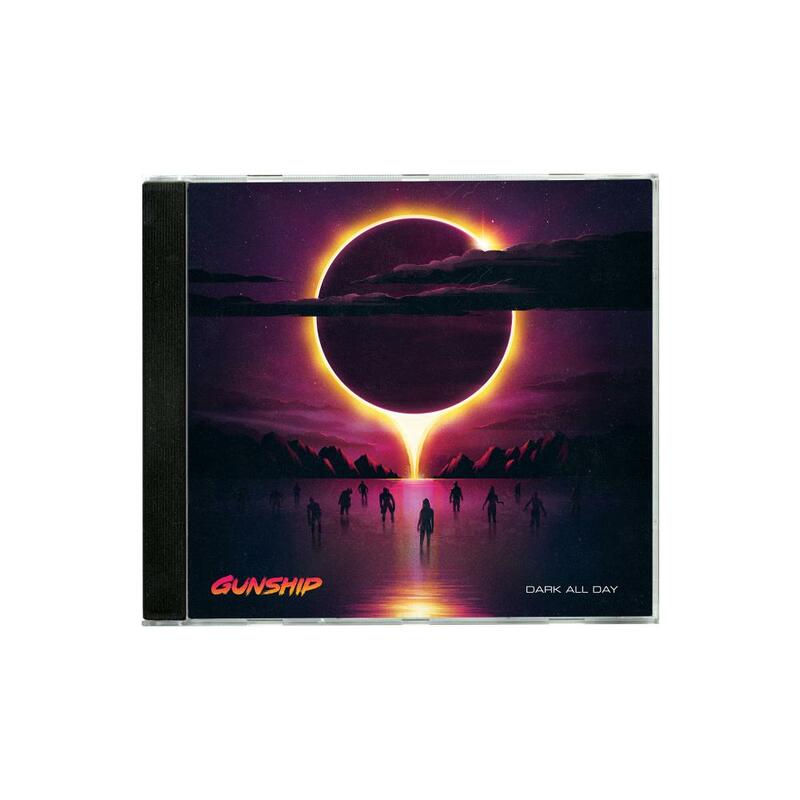 I was perusing through one of the Metal channels I'm subscribed to and stumbled on to a great metalcore band named Catch the Sun, and one of their album covers has Griffith on it. 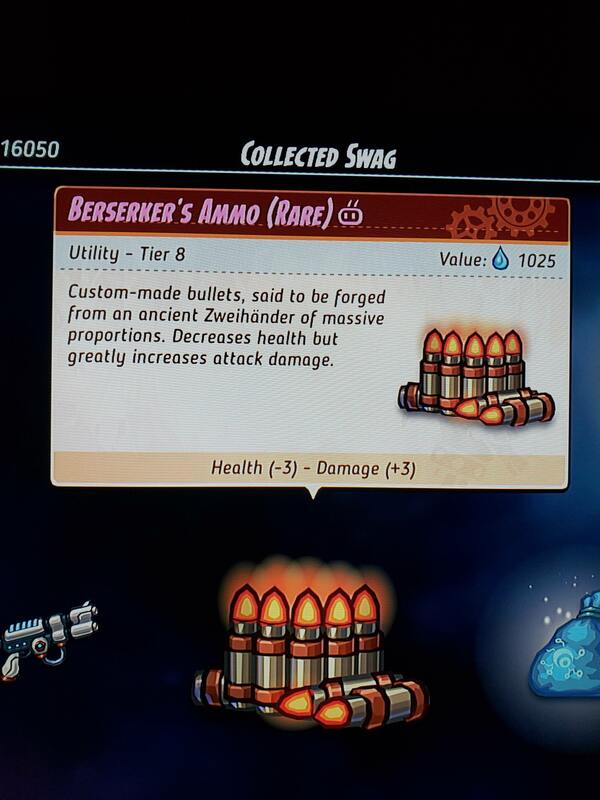 From Steamworld Heist, which I'm about 10h into now. Towards the end of the game you can find these. The description makes it pretty obvious that it was an intentional reference. 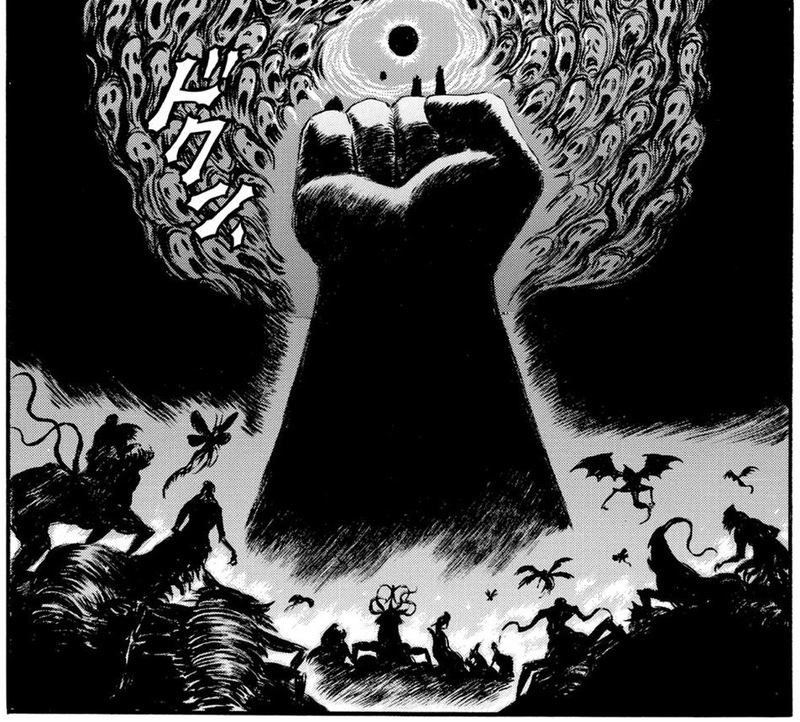 This is going to be a really big stretch, but having read through Berserk a number of times now I feel like some of the old fantasy novels I used to read remind me a lot of certain aspects of Berserk. For example, I was a huge warcraft geek for the longest time. I read a lot of fantasy novels that followed the series lore, both canon and non-canon. One series that really has a Berserk-ish kind of feel to it is Richard A Knaak's War of the Ancients trilogy. Not to spoil to much, but it follows a few major characters from the Warcraft lore back into the past around the time of the great sundering (when Azeroth was literally split in half by a huge explosion). Knaak goes quite a ways away from what would be considered canon in the Warcraft universe, but the way he writes the characters is really what made me love the books. With the way Illidan is written in this trilogy, his character definitely has some Griffith vibes to it. Obviously they are not the same character at all and Griffith is a much deeper and better written character but there are some similarities in their insatiable thirst for power as well as the love triangle between Illidan, his brother Malfurion and Tyrande. The icing on the cake though is the way a secondary character like Broxigar is written, he's definitely got a hint of Guts written into him at least IMO. He's got that existential / nihilistic vibe before accepting the way things are later in the story and doing some pretty heroic stuff. Again, I'm not trying to say that Richard Knaak's novels are on the same level as Berserk, (Berserk is so, so much better) but there are some similarities in how the characters are written and if you enjoyed any of the Warcraft games I definitely recommend giving them a read!! Even if you are just looking for something fresh and have never played the Warcraft games I think Knaak does a good enough job with world building that you would still enjoy the novels / understand what is going on. Howdy. New member. Thought I'd throw in my two cents. MGSV kinda gives me (obviously not intentional) Berserk vibes, what with Venom Snake having an artificial arm and an eyepatch. The themes, setting, and plot are all completely different, but it's hard for me to see Venom Snake and not think of Guts. 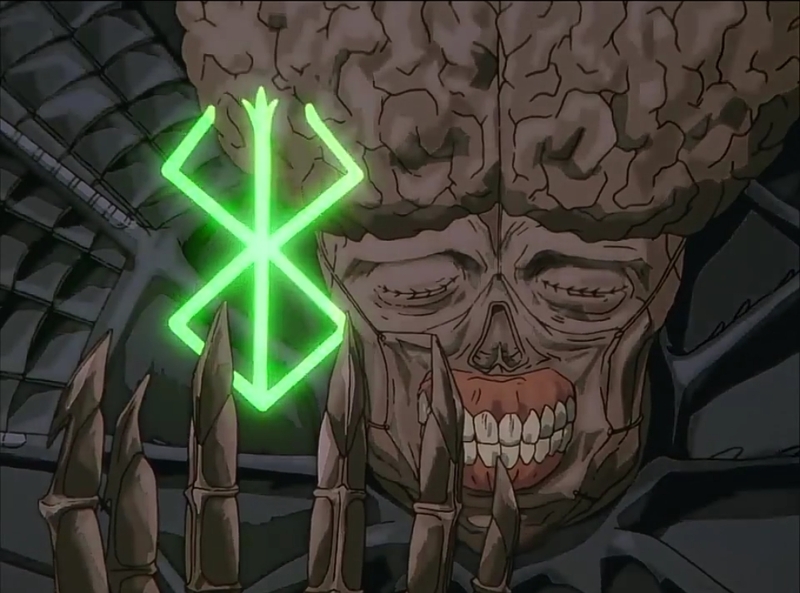 Isn't the first time they feature Berserk ... and on the new album they reference it in their new song with the brand on the guitar and a quick shot of Guts (https://www.youtube.com/watch?v=60ruvzfXQoE&frags=pl%2Cwn) along with other series like Street Fighter, Mad Max, Blade, Predator. I don't know what fans are supposed to feel about this stuff. Is it basically an unofficial co-marketing thing? "Like Berserk? We do too! 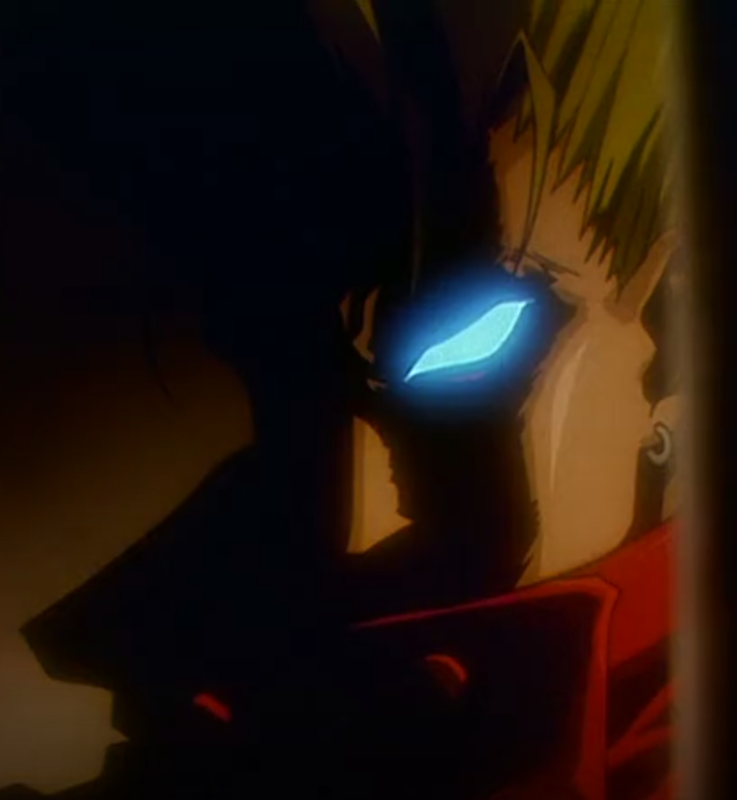 Now buy our music... "
I was rewatching Trigun recently, and I think shots like this add to the pile of reasons for why Madhouse would be right on the money for the production of a Berserk anime, that is, if Berserk were more realistically adaptable and Madhouse actually wanted to do it. Another band inspired by Berserk that call themselves - Brand of Sacrifice. They had a new album come out in September called The Interstice with song titles like Casca, Conviction, Eclipse, Millenium (https://uniqueleaderrecords.bandcamp.com/album/the-interstice). Their merch for sale that kinda looks like Berserk fan-art ... there's also a Skull Knight shirt and Eclipse shirt. Well, I appreciate their dedication to subtlety. Not a big fan of these groups who just copy paste designs and names. Freedom rays awaken the chosen ones"
Let me know if the coincidences are as striking as they seem to me or not really. Hey, it's very subtle. You can't understand a damn thing that's being sung, and because they all sound the same, you'll never know what song you're actually listening to. I'll never understand the appeal behind this kind of "music." Sorry but I see absolutely no relation there. I understand the feeling. There are a lot of style that I don't understand the appeal too. Even though I'm not a big death metal fan, metal is not one of the kinds I don't understand the appeal. To each is own I guess. Btw the cover looks mostly looks like one of the Ganishka spawns. That's probably the case. I guess my mind just stretched it out of proportion because the terminology used vaguely resembles the themes of the eclipse. These ones are particularly bad from what I've listened to, so that doesn't make it easier. Pretty much what I thought when I listened to it. ^This. I have always thought this!!! A lot of people have over the years. 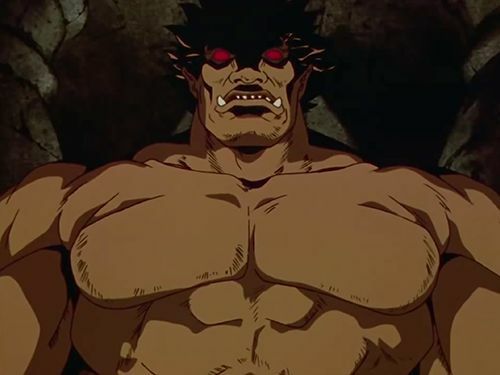 It wouldn't be hugely surprising if Gouki's appearance had been inspired by Zodd when he was originally created.